How to build a brand: First, own an idea. >> Want to build a brand? First, own an idea. Ideas on how to build a brand. How to build credibility and authenticity for existing brands. How to engage an audience and convert leads into sales. It’s those big ideas — paired with exceptional execution — that produce growth for clients and vault agencies into the national spotlight. The same can be said for start-ups. Businesses that start with a big idea, and then stick to it, are the ones that become iconic brands. Maytag owns the idea of worry-free appliances. For more than 30 years their advertising has brilliantly communicated the idea of dependability with the lonely Maytag repairman who never has anything to do. Now he even has an apprentice. 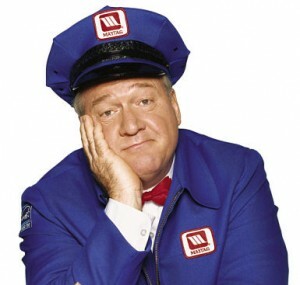 The Leo Burnett Agency introduced a strapping new version of Maytag repairman… a side-kick who can talk about technological advancements and appeal to younger women. 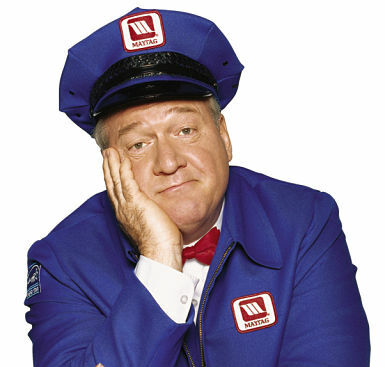 The Maytag repairman character is so iconic Chevy actually used him in a television spot touting the Impala’s reliability. Maytag owns the idea. Chevy’s just borrowing it. Maytag’s core brand idea helps segment the market and differentiate them from the competition. Nobody else in that category will try to claim the idea of “reliability.” Won’t work because everyone knows that Maytag = dependability. Google knows how to build a brand. They own the idea of online search. So much so, it’s become a verb. “Google it.” It’s the world at your fingertips. Campbell’s owns the idea of “comfort food.” That brand is not about flavor, it’s about the rainy day when your kids are home for lunch and you sit down for a bowl of soup and grilled cheese sandwiches. Campbell’s warms, comforts, nourishes, takes you back in time and puts a smile on your face. For only about one dollar. Volvo owns the idea of safety. That’s their clearly perceived position in the automotive market. Even though driving an automobile is inherently risky, people believe they are safe in a Volvo. And that belief feeds the folklore that sustains that idea and Volvo’s brand image. Even though Volvo models have all the glamorous features of a luxury brand, they’ll never be seen as luxury cars. Just safe cars. Funny story about Volvo shopping… Some years ago I seriously considered buying a Volvo SUV for my family. I did the research and went to the local lot for a test drive. But the salesman blew it. He was so adamant about the brand’s safety record, he tried to convince me that Volvo actually used Swedish convicts as live test dummies. True story, he claimed. 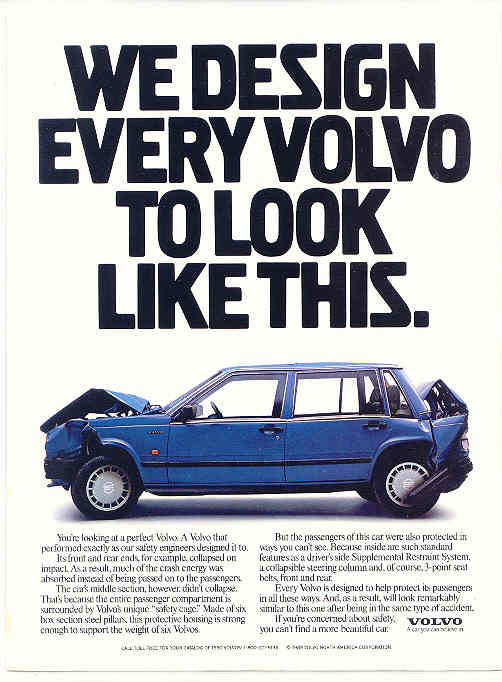 That’s how Volvo developed such a safe car… by crashing them with convicts at the wheel. Needless to say, Volvo’s reputation for safety and the car’s luxurious ride couldn’t trump the salesman’s idiocy. I bought an Audi. McDonald’s, of course. But when people began to realize that fast food wasn’t so good nutritionally, Subway had their own idea… “Healthy Fast Food.” It was healthier than McDonalds, and Jerod proved it by losing like a thousand pounds while eating Subway Sandwiches. That simple idea has propelled Subway to #1 in the fast food category. There are 44,800 subway Subway stores to 36,500 McDonald’s stores. Now Jimmy John’s owns the idea of FAST sandwiches. Not fast food, or sandwiches like Subway, but sandwiches delivered quickly, wherever you may be. That’s a good strategy of differentiation, especially because their sandwiches aren’t all that great. If they stick with the idea, and execute the idea religiously by actually delivering every sandwich faster than anyone expects, they’ll have a winning business formula. It’s a core brand concept that’s easily demonstrable in advertising. And that’s particularly important when it’s a category of parity. The sandwiches at Quiznos, Tomo’s, Jimmy John’s and Subway are all pretty much the same, so the advertising idea becomes even more important. State Farm has a long-running slogan, “like a good neighbor.” Unfortunately, neither the advertising nor the customer service support that idea. Geico saturates the airwaves with humorous advertising and outspends everyone in the insurance category. Thanks to an annual budget of $500 million a year the Geico Gecko and the cavemen have become fixtures in American pop culture. But the message is all over the place. There’s no core brand idea that anyone can grasp. gum, a fairly new brand from the master marketers at Wrigleys. The Orbit girl “cleaning up dirty mouths” campaign helped them capture the #1 spot in the chewing gum market. Coming up with a core brand concept is hard work. You really have to dig. And think. And explore. Many big brands don’t own an idea at all. JCPenny, or JCP as they’d like us to say, doesn’t own an idea. They’re trying desperately to be younger, cooler and more hip than they used to be, but the name change and the slick new execution of of their print advertising doesn’t make up for the lack of a relevant idea. Whether you’re selling insurance or chewing gum, building a brand begins with a simple idea. Anybody can borrow some money, hang up a shingle and start their own business. But the companies that last — the ones that become iconic brands — almost always start with a clearly defined, highly demonstrable idea that goes beyond just the product or service. Do you need ideas? Need help with your brand messaging? Get started right away. Click here. Want to learn more about how to build a brand? Try this post. Advertising has been maligned in recent years as difficult to measure, but as a branding medium, I still believe it takes center stage. Several years ago the AAF launched a campaign to show that advertising was how “Great Brands Got to Be Great Brands”, a great campaign developed by Carmichael Lynch and guided by a powerful advisory board of ad and media execs. The ads showed a Coca Cola bottle, a Sunkist orange, an Altoids package and the Energizer Bunny, among others – with “advertising” replacing the name. The name was unnecessary because the brand was iconic. Definitely a good start to own an idea that optimistically can lead you to something valuable and will definitely attract your target audience and this notion really helped me a lot. Yes, brand ideas are too big for advertising, but I believed that we had stopped defining our job as “advertising” a while ago. A brand idea can be experienced throughout many medias, each with a defined purpose within the whole project: think at a tv commercial that is a trailer for a website where you can experience the brand message, join a social network and download discout coupons for your grocery store. Thinking that web is for brand ideas and tv is for sales is the kind of naive attitude that we can’t stand in our clients. this post to him. Pretty sure he’ll have a good read. Thanks for sharing!